Smells so good you would think you were making Gingerbread Cookies! In a medium saucepan whisk together dry ingredients. Next mix in the water, oil, and orange extract and stir until a thick batter is formed. Cook the mixture over low/medium heat until a thick dough forms. Turn out onto parchment paper and knead until smooth. Makes about 2 cups of dough. Never under estimate the power of play-dough. This morning I finally tossed out our pumpkin spice play-dough and you know, it still smelled yummy but the salt was starting to crystallize the dough making it harder to keep any shape at all so, I whipped up a brand new batch of play-dough. 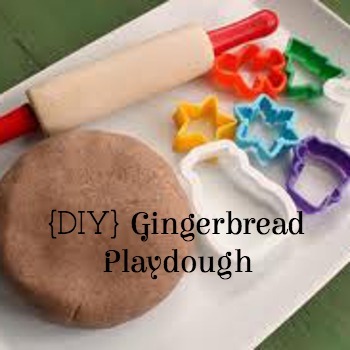 This recipe is really easy to make with little helpers. Punky quietly played for over an hour. « Polar Bear, Polar Bear, What Do You Hear?